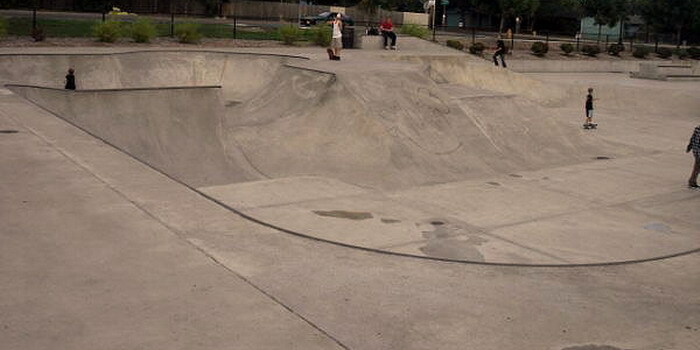 Location Reedville Skatepark in Hillsboro: From Portland, take Hwy 26 west (about 15 mins) to the Cornelius Pass Rd. exit. Head south on Cornelius Pass Rd. for about 2 miles. You will come to Baseline Rd., there will be a shopping center on the right. Stay on Cornelius Pass Rd. past Baseline for maybe another 1/4 mile. The park will be visible on the right. If you hit TV Hwy (Hwy 8), you have gone too far. Description: Reedville Skatepark this is another great park in Oregon for street skating. It is very wide open and has a variety of banks, ledges of different heights/lengths, a double set (5 gap 5) with handrail, and a couple of euro gaps. There is a bowl in the far corner, along with a 7-8ft quarter along the back wall. Otherwise completely street. Ledges here are beefier than at most parks, so be careful unless you a experienced. There are smaller ledges to learn on as well. Special Comments: No bikes allowed!! Don't come here with a bike or scooter, as the local police have nothing better to do than write $200 tickets at the skate park (Taxpayer money hard at work) Pics coming soon! !